Ever since Interview Mocha came into inception, its aim is to help hiring managers and recruiters in pre-screening of candidates providing them the world class product and skills assessment. Now this caught the eye of Siftery, a database where they compare companies with similar stacks and looks for differences to make some recommendations. 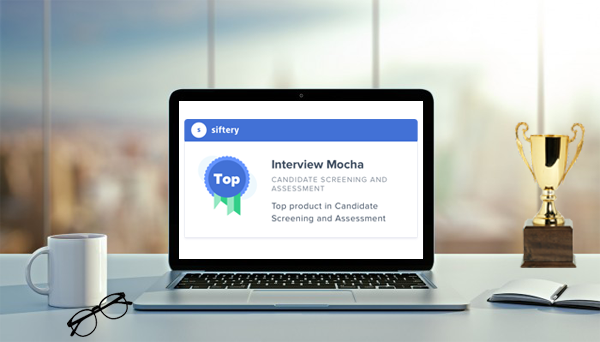 We are happy to inform you that Interview Mocha is ranked as Top Product in the Candidate Screening and Assessment category by Siftery. In Interview Mocha reviews by Siftery, Interview Mocha has been awarded the with the Best in Class Award. It is awarded to the companies comparing the market share in that particular category. Interview Moch, an online assessment software is on its continuous journey to provide updated and latest skill assessment tests along with hiring analytics. Interview Mocha has a modular library of 1000+ skill tests, simulation-based tests, actionable analytics, and productivity features to help hiring managers and recruiters hire better and faster every time. Interview Mocha invites all the existing and prospective clients to expect an awesome product, advanced features and 24x7 support in present and future. We promise you your productivity and success every time when it comes to pre-screening solutions. We thank Siftery and accept the award utmost happiness and satisfaction.